Since 1 July 2015, the Diepholz-based company has sourced its energy from hydroelectricity produced at the Stadtwerk Huntetal Diepholz (municipal utility company) and is therefore saving approximately 1,170 tonnes of CO2 per year. 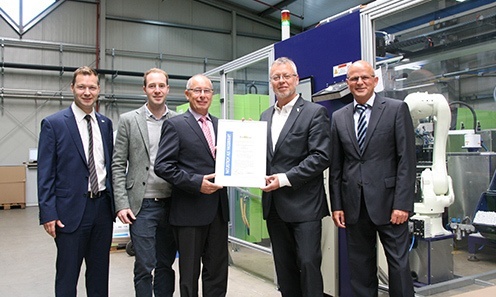 Managing director of the Stadtwerk Waldemar Opalla and Head of the Business Customer Division Lars Thieman presented OMEGA directors Walter D. Olbert, Jürgen Exner and Joel Olbert, who is responsible for strategic development at the company, with the Natural Electricity Certificate in recognition of the company’s commitment to the environment. ‘We take sustainability and protecting the environment very seriously at OMEGA,’ explains Joel Olbert. ‘We go to great lengths to ensure that our manufacturing processes are as climate-friendly and energy-efficient as possible. Utilising renewable energy from the Stadtwerk once again underscores our ecological practices and enables us to further reduce our carbon footprint.’ OMEGA has achieved certification in environmental and energy management and continuously implements energy-saving and environmentally-friendly measures. A further example of the company’s commitment to the environment is demonstrated by work that is currently taking place to convert all of the lighting in the company over to energy efficient LED light fittings.